Honeycomb elastic panels above the arch area makes for a very comfortable boot! Please Note: We can ship Sidi products to US, US territory or APO/FPO addresses only (per manufacturer’s restrictions). Visit our Sidi Sizing Information page for complete size conversion info (ladies can use the chart at the bottom of the page). 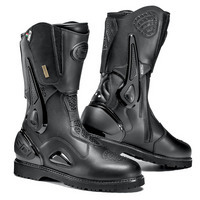 Sidi boots are very consistent for fit from one model to the next and this one is no exception. If you know what size fits you in other Sidi models, then choose the same size. Overall width is “Medium” or “D” width.